Mobiles make terrific decorations and give a sense of calm and ease as they slowly move in air currents. In this project, see how to use floral wire to make a mobile of easy-to-fold Origami Flying Birds. 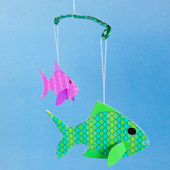 The craft also includes instructions for making a fish mobile and suggestions for other mobile themes. This is a great project for children and adults to do together, and it also teaches the kids about balance and attention to detail. With a little help from an adult or teenager, children will learn how to balance the mobile by moving the supporting threads on the mobile rods (floral wire). 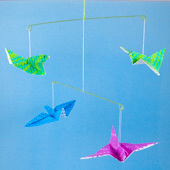 Related craft: You can also use pipe cleaners (chenille stems) to make mobiles. See how in the Halloween Mobile craft project. Read through the project and gather the materials needed for making the mobile. 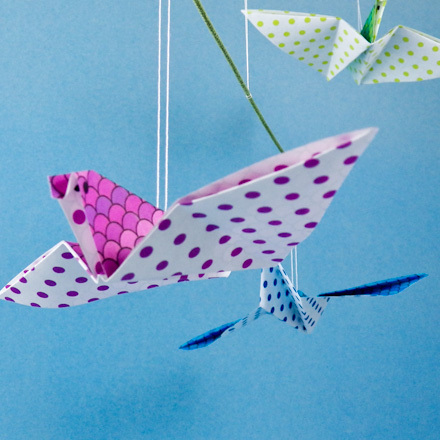 If you are doing this craft with a group, you may want to make the Origami Flying Birds in advance—perhaps split the craft into two sessions. 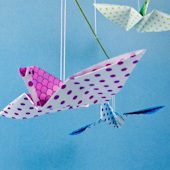 Follow the instructions in the Origami Flying Birds craft project to make four flying birds. Fold the birds from colorful paper in two or more colors. Tip: Make a fish mobile using the fish in the Fishing Game craft project. Make four fish in two or more colors. Using a needle and thread, add a loop of thread to the top of each bird through the center crease. To do this, cut an 6" to 8" length of white thread, and thread it through the eye of the needle. Poke the needle through the center crease just in front of where the two center creases meet. Pull one end of the thread completely through to the other side. Tie both ends together in a knot to form a loop. Check to see that the bird hangs properly when suspended from the hanger. If the bird tips too far forward or backward, remove the hanger and try again, punching the hole in a new location. If the bird tips forward, move the hole for the hanger forward. If the bird tips backward, the new hole needs to be farther back. 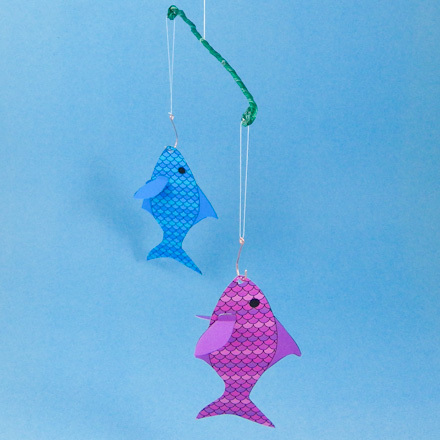 Tip: If you are making a fish mobile, thread the hanger through a small hole punched in the fish nose or in the top fin, depending upon whether you want the fish hanging vertically or horizontally. Cut two 9" lengths of cloth-covered floral stem wire to make two mobile rods. Cutting an 18" floral stem in half works well. You can also use spooled floral wire if it is heavy (about 18 gauge) and cloth-covered. Use your needle-nose or round-nose pliers to form a small loop in each end of the floral wire. Leave a small gap in the loop. Repeat for the other wire. Hang one mobile rod from the other with a doubled 8" to 12" length of string or thread. Hold the upper rod in one hand and adjust the hanger so that the lower rod is balanced. Tip: Move the hanger toward the end that dips down until you find the balancing point. Cut a length of string to use as a hanger for the mobile. Double the string and tie the tails together in a knot. To attach the hanger to the upper rod, lay the loop over the center of the rod and thread the tail under the rod and up through the loop. Pull tight and check the balance by hanging the mobile from the hanger. Tip: At this point, you may want to secure the hangers by applying a drop of white glue (PVA) to where the hangers and rods meet. Let the glue dry. Hang one bird from each end of the mobile rods by slipping the thread hanger through the gap in the loop. Have a friend help by steadying the mobile as you add the birds. Tip: The mobiles can be made with any theme you like. 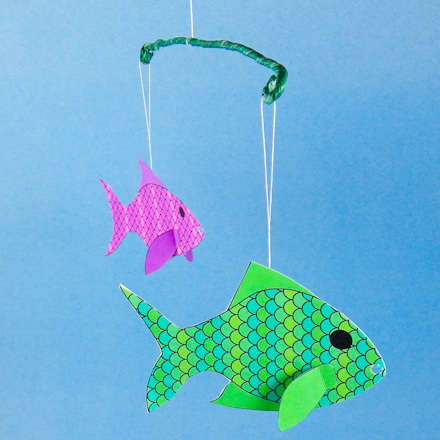 Use cutouts from the Internet or magazines, make some Paper Flowers, create a few 3D Paper Fish, repurpose another craft like Cardstock Animal Bookmarks, or attach lightweight holiday decorations like the Miniature Christmas Tree Ornament or Snowman and Angel Suncatcher Ornaments. That's it! Your mobile is complete! Tip: Mobile rods made with cloth-covered floral wire that comes on a spool have a more organic look. Tip: The birds on your mobile may be seen from the top or the bottom. Use two-sided paper to make your Origami Flying Birds so that they look pretty from any angle. 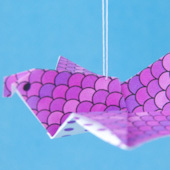 Tip: Place the hanger for the origami flying bird just in front of the point where the two center creases meet. 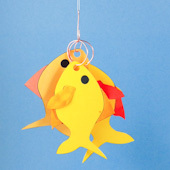 Tip: A cute mobile can be made with fish hung from hooks. See the Fishing Game craft project for printable fish patterns and instructions for making hooks. Tip: A mobile is a cute way to store the fish from the Fishing Game. Hang them in groups from hooks and they will be handy any time you want to play the game.